You are here: Home / DOT Medical Card / What do I need for a DOT physical exam? Make sure to continue taking your prescribed medications as usual. Wear loose clothing for the physical exam. Don’t use the restroom just before your appointment. You will need to give a small urine sample for a kidney screen. This is not for a drug test. Your valid driver’s license and /or other photo ID. Eye glasses or contact lenses, if applicable. If you recently had an eye exam it would be helpful, but not necessary, to bring that exam report with you. A working hearing aid, if applicable. List of medications, and the name and contact information of the prescribing doctor. Medical release opinion letter (get template) from your primary doctor or specialist for any medical conditions being treated, or recent illness, injury, or surgery. Current FMCSA Waiver or Exemption Certificate or Skills Performance Evaluation if applicable. The doctor will review your health history with you. Conduct a thorough physical examination. Run a urine screen (dip-stick test) for urine specific gravity, urine protein, urine blood, and urine sugar, to check for the onset of possible disqualifying medical conditions. How Long Is A DOT Medical Card Good For? 2 years – If you meet all the FMCSA DOT Regulations for Commercial Driver Fitness. A limited time, usually 1 year or 6 months, if periodic monitoring is required for certain medical conditions. A limited time, usually a 1 to 3 month window, if you have a recently diagnosed condition that you are working with your primary care doctor to get under control. Disqualified. A medical condition or medication may cause your medical card to be disqualified until the disqualifying conditions are rectified. Help the DOT doctor help you. Come prepared to your DOT Physical exam appointment. Bring everything you need. Then it’ll just be a matter of checking through each item on the Medical Examination Report and you should be done and set with your new DOT Medical Card in about 30 to 45 minutes. Thanks to Trucker Docs expert panel doctor, Dr. Kenn Seals, for contributing to this article. You can find Dr. Seals at Chiro Stop in Salt Lake City, UT. Do I need to bring the DOT Physical form with me? No. The DOT doctor will have the forms that are needed. • The Medical Examination Report MCSA-5875 (Long Form). To save time, some DOT physical offices will make the Driver Information and Health History section of the Medical Examination Report available before your appointment, so you can complete it before the exam. Do I have to get naked for a DOT physical? No, you do not have to get naked. You may need to loosen or remove your shirt so the examiner can listen to heart sounds and do an abdominal check. No, drug testing is not part of a DOT physical exam. Be aware that if you have been sent by your company for a DOT physical, they may request – in addition – that a drug screen is done. The drug test is an additional cost. What is the DOT physical urine test used for? The urine test is just a kidney screen to test for sugar and protein. It’s done to determine that there is no early onset of conditions like high blood pressure breaking down the kidneys, or early signs of diabetes, or kidney infection. What if I conceal a conditional or disqualifying medical condition? On the first page of the Medical Examination Report you must certify that your responses are complete and true. Making a false statement for concealing a medical condition may invalidate the examination and the Medical Examiner’s Certificate. Here are some tips to manage your blood pressure and have it measure as low as possible during the exam. For any other questions go to our forum for Frequently Asked Questions. TRUCKER DOCS™ is a dynamic panel of DOT Certified Doctors helping Commercial Drivers through the DOT Physical jungle. We are DOT certified medical examiners, and we're around to answer questions - especially those tough ones related to a driver's personal circumstances - that no-one else is answering. Please leave a QUESTION or COMMENT below. You could either go for the new examination or try to find a new medical doctor that will sign you off. I have neourpathy in my leggs and I lost my leg below knee. I’m suppose to be drive 3/4 commerical truck across stateline with livestock (empty). My doctor told me he would pass me on DOT and the company doctor didnt do that, my employer is getting upset with me because this is dragging out!!! Know what should I do??? The DOT examiner is using the FMCSA guidelines and you fall under the states regulations. You are not an OTR driver and should not be evaluated as one. Explain to the examiner that you drive as a non OTR driver and have the information from the state licensing department that supports the states guidelines vs the FMCSA. The examiner should know the FMCSA AND the states requirements/guidelines. Hello, I have type 2 diabetes and high blood pressure both controlled by medication, would like to know if either would disqualify me from passing a DOT physical? 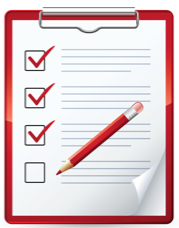 You’ll need a medical release form from you treating physician. Insulin dependent is a disqualified for interstate drivers. It is a safety issue. You should be fully recovered before you go back for your next DOT physical. I had a hair test done the doctor call 2weeks later say I tested positive for. Marijuana and I never smoke the drug in my life can anyone explain.thanks.therefore I was terminated.its quite obvious it’s wrongful termination. You can request a retest if there is any questions about the results. Wait, what?! Hair test?! What is this? I never read anything about a hair test? Is that a new drug test? Hair testing for drug use has been around for quite a while, but too expensive for most companies. It does have the capability to determine drug usage with in the past year. 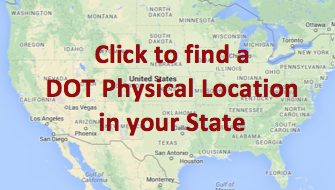 Yes, you can get your DOT physical done in any state provided you have it done by a certified medical examiner. In Ga, why would one need a DOT Medical Card if they do not have a CDL? 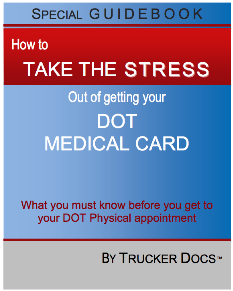 In most states, you’d require a DOT Medical Card to drive a tow truck or any other larger vehicle under 26.000 lbs. Are there any doctor’s out there that will give you a DOT physical that won’t require the sleep apnea test? I currently go to a nurse practitioner and she does not think I have sleep apnea at all. Unfortunately she does not give DOT physical’s. I do not have a CDL, I need the DOT card to drive public transportation with a regular driver’s license. The DOT physical I got through a company paid health clinic said I need a sleep apnea test because my BMI is over 35. The sleep apnea test facility just called and they want $700 up front of which I do not have. Seems like a total rip off because I do not even have it and have never shown any signs of it. Is there any way around this ordeal? You do not fall into the class A, over-the-road driver, category. So explain to the CME doing the examination what your job is. Unless you meet about 8 different things in your physical that point to possible sleep apnea, not counting bmi and neck measurements, you should not have to have a sleep study done. Do some looking around to find a CME that understands the difference between drivers and have them do your examination. I have had a class A CDL while working for municipal government. We have always been exempt. When does the new regulation requiring a Medical Card start and how was the notification sent? I found out PennDot was also exempt and is now a requirement. Were CDL holders notified of the change? DOTPhysicalDoctors is focused on questions that are medically related for obtaining a medical card. In particular for federal regulations in regards to requirements. Your questions are drivers license related. You’ll need to ask these question of PennDot, so contact your local drivers license department. Hallo, it’s possible to do dot medical phisical in Washington with Illinois CDL? Really helpful post. 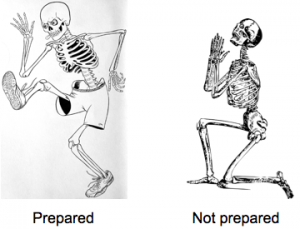 Many people don’t have a clear idea about dot physical preparation. This will help them for sure. Thanks. Can you get a medical card with only a permit even if you are over 21? Most states require a medical certificate before you can get your permit, so I would say the answer is yes. Wanted to know what are the actual steps when going in to take your Dot exam… Do you give your urine first ? Or you do the examination which one? I need step by step in order please… Thank you!! Get our FREE DOT Physical Guidebook and you’ll have all the information you’re looking for. Hello when I give a urine sample for the dot medical card what are they looking for? A class C license does not fall under FMCSA regulations. You need to check with your state DLD to determine the direction you need to go. Each stae is different and you should be able to drive with your states vision waiver. I am on medical leave for an broken foot, my medical card has expired, can I still take the DOT exam and pass? No. If you are unable to fully return to work as a CMV operator, then you would not pass the examination. Just talk with your state Driver’s License Department to explain your present situation and when you’re all healed, then go an get you DOT examination. You should not have any problems. If my husband has kidney disease can he still get his medical card. He is not on dialysis. I was told by Fmcsa that he can still drive a truck but the doctor who did his physical is refusing to give him his medical card. We live in Pa. His card expires in 10 days. Get a medical release form completed by your primary doctor stating your hubby’s conditions and where he is in the scheme of things. That should answer most of the questions that any CME will have. Then go somewhere different for the examination. The first doctor is not fully understanding what the FMCSA is saying. CME for DOT certification is there one in Delaware???? Sorry DOTPhysicalDOCTORS doesn’t have a CME in Delaware. Best to Google “dot physical Delaware”. What If I am taking prescribed medication for anxiety? My doctor has me on some for now. The Army is very stressful. I don’t think I will have a problem when I get out of the Army. I retire soon. DOT physical exam locations in New York. We’re adding more as we grow our list of driver friendly™ doctors.